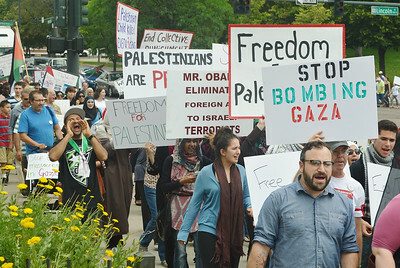 Images of protest by Palestinians and supporters against Israeli attacks on Gaza. 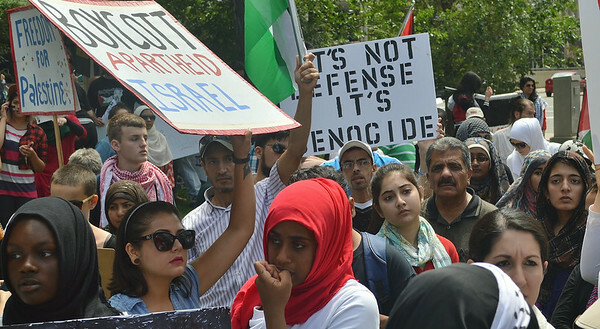 Includes demonstrators marching with signs, Palestinian flags and banners. 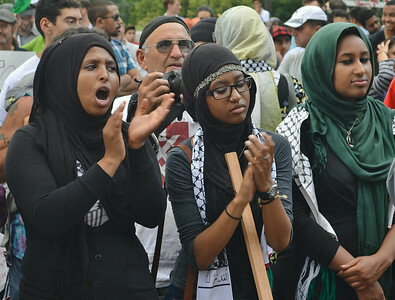 Marchers include Muslim men and women, some wearing traditional dress such as Hijabs and Keffiyehs, many children and teenagers. Shots of an Iman leading the afternoon prayer also included. 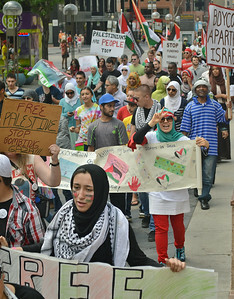 Group of protesters marching with signs about Palestine and flags, large group of marchers in background crossing street. Group of protesters marching with signs about Palestine, one young man raises hands to face and shouts. 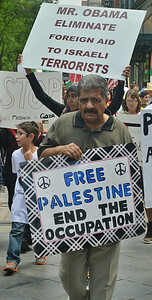 Close-up of man wearing Palestine headband, other marchers with signs, including youn boys, behind him. 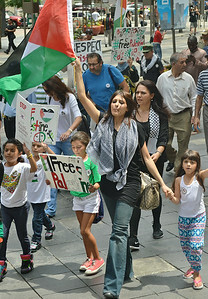 Woman raises Palestinian flag in air, walking with small children, other protesters in background. Large group of demonstrators at Palestinian protest, including women wearing headscarves, variety of faces, young, old, different ethnic groups. 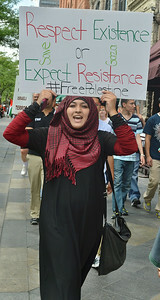 Woman wearing headscarf shouts and flashes peace sign, other protesters around her with signs, other women with scarves. Large group of marchers at Palestinian protest, many with signs and flags, two women and other shouting. 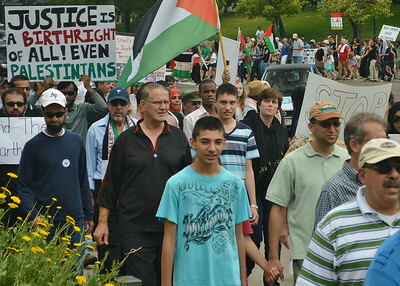 Two men marching in Palestinian protest, one with Palestinian flag, other with American flag, large number of demonstrators in background. Large number of marchers at Palestinian protest, many carrying signs and flags. 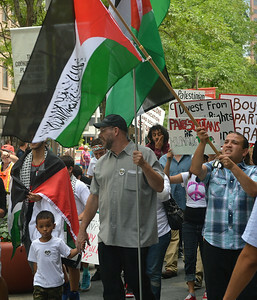 Man carrying Palestinian flag with Arabic writing on it, next to him, man with flag, holding hand of young boy, other protesters with signs march behind them. 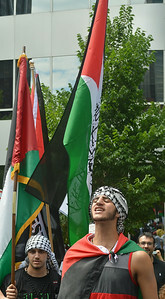 Young Palestinian man wearing Keffiyeh, shouts while speaking at rally, Palestinain flag and other demonstrators behind him. 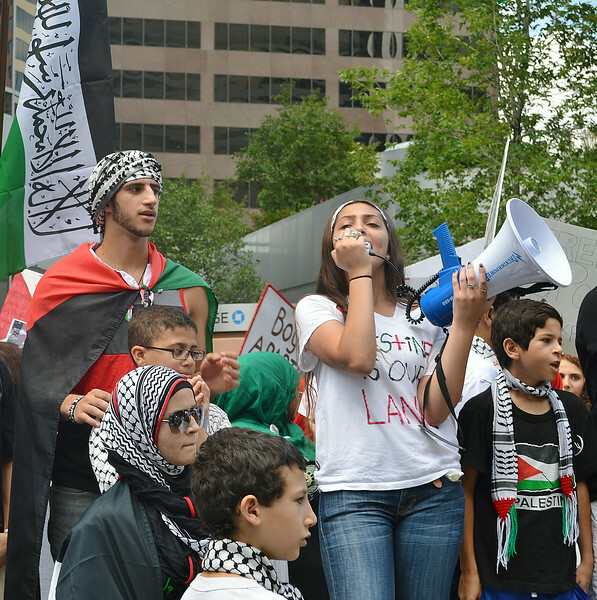 Young woman speaks using bullhorn, other demonstrators with signs and Palestinian flags around her. 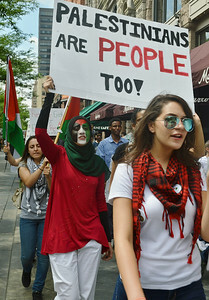 Two young woman march in protest, one wearing Keffiyeh, other wearing headscarf and face painted like Palestinian flag. Muslim woman with face painted like Palestinian flag, wearing headscarf.head scarf. 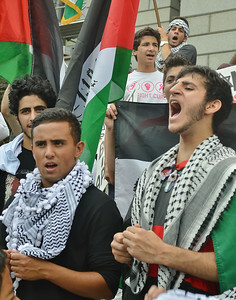 Young boy shouting at rally, young man with bullhorn wearing Keffiyeh next to him, Palestinian flags in background. Young woman speaks using bullhorn, Palestinian flags next to her, young boy and woman wearing headscarf in foreground. 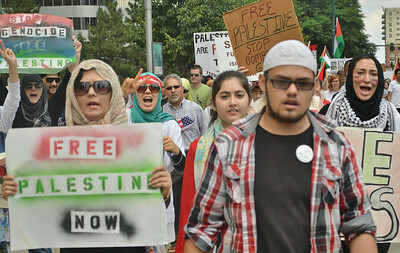 Muslim woman wearing headscarf raises sign with peace sign on it, other Muslim women with signs in background. 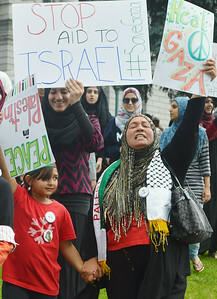 Muslim woman wearing headscarf raises sign with peace sign on it, holding hand of young girl with sign, other Muslim women with signs in background. 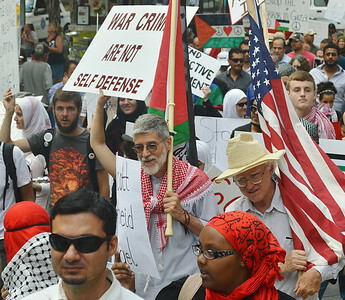 African, Muslim, woman raises sign about Israel in air, others march behind her. 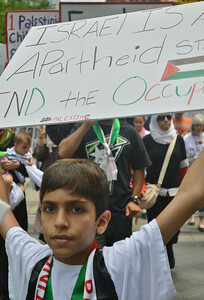 Close-up of young boy with sign about Israel and wearing Palestinian scarf, other marchers in background. 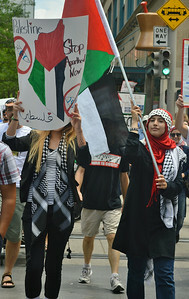 Woman wearing headscarf, carries Palestinian flag, other woman with sign beside her. 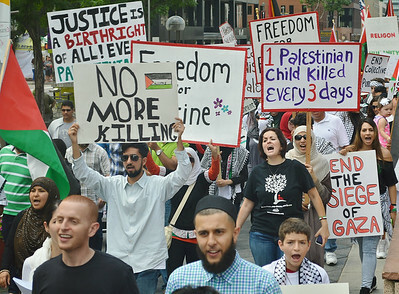 Young girl marching with palestinian flag, other protesters behind her including woman whose face is framed by flag. Older man carries sign about Palestine, other protesters march behind him. 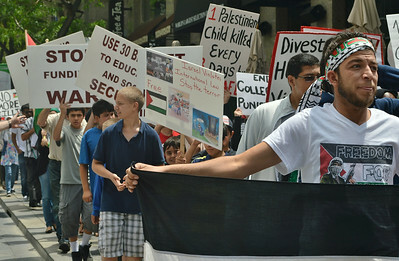 Three young boys at Palestine protest, one holds flag, other with signs, other demonstrators in background. 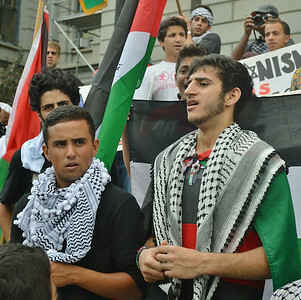 Men wearing Keffiyehs waving Palestinian flags, clock tower building in background. 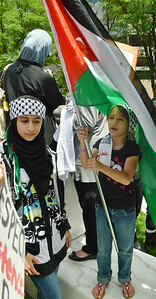 Two young girls wearing Keffiyah headbands, one standing under large Palestinian flag she is holding. Muslim man, an Iman, speaks with bullhorn, young woman next to him holds her hands up to her face, other protesters around them. 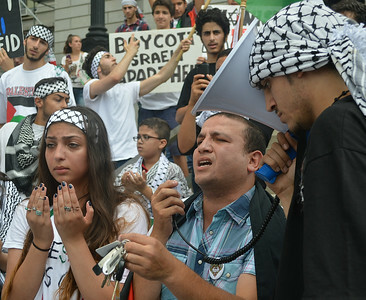 Three young Palestinian boys standing on steps at rally, young women behind and above them. 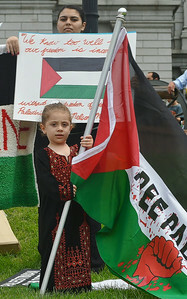 Young girl standing next to Palestine banner, holding Palestinian flag. 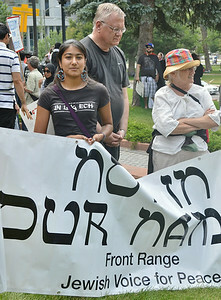 Young woman standing in front of banner with writing in Hebrew. 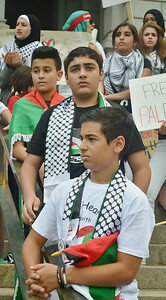 Young boy with sign waves small Palestinian flag, other boy with larger flag in background. 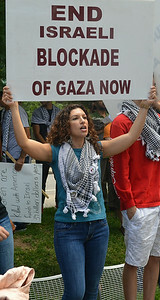 Woman wearing Keffiyeh scarf holding up sign about Israel and Gaza. 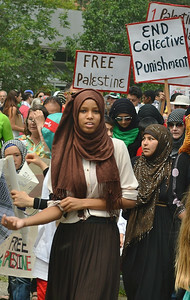 Young African-American Muslim woman wearing headscarf, marchers with signs about Palestine behind her. 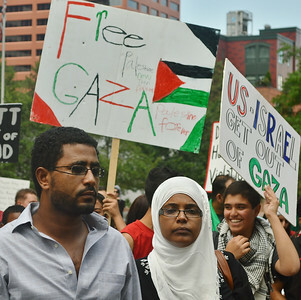 Muslim man and woman, woamn in headscarf, protesters behind them with signs about Gaza, including boy smiling. 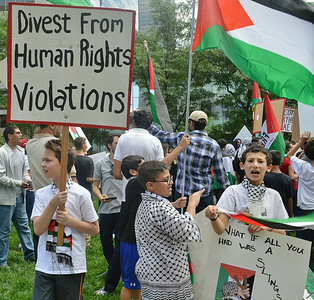 Young boy holding sign about Israel rides on top of fathers shoulders, father wears Keffiyeh, other protest marchers behind them. 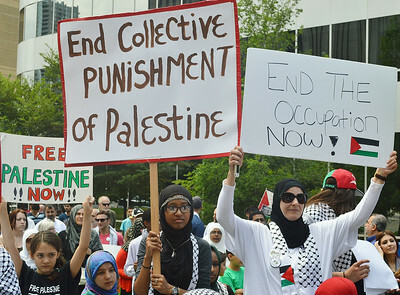 Muslim woman in traditional dress raises sign about Palestine above head, other demonstrators behind her. 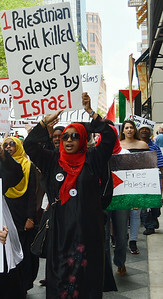 Young woman wearing headscarf marches with sign about Israel above head. 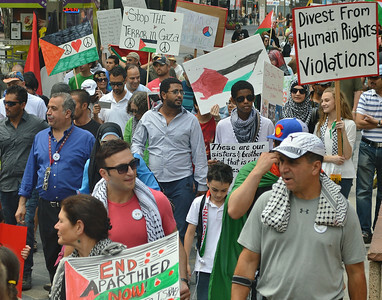 Woman with Palestinian flag, other marchers behind her. 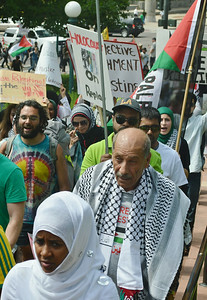 Senior man wearing Palestine t-shirt marching up steps other around him with signs and flags. 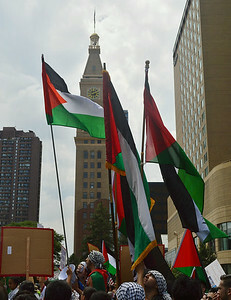 Woman wearing Palestinian flag scarf and black headscarf raises hand in peace sign. 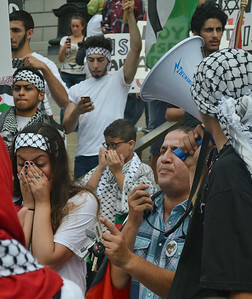 Muslim man, an Iman, speaks through bullhorn being held by young man wearing a Keffiyeh, young woman next to him holds hands up in prayer. 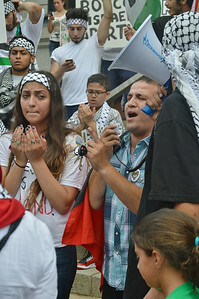 Muslim man, an Iman, speaks with bullhorn, young woman next to him holds hands up in prayer. Three Muslim women wearing traditional garb at rally, two applauding.